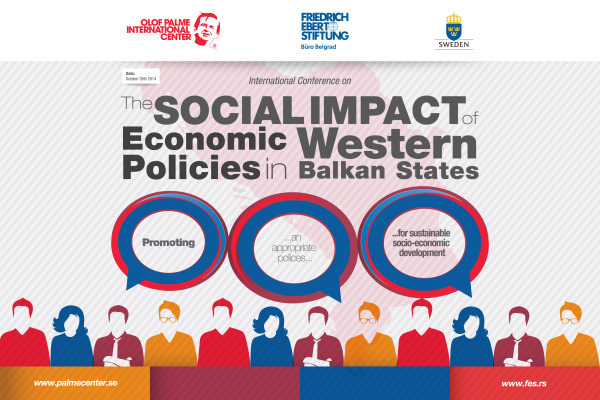 Olof Palme International Center in partnership with Friedrich Ebert Stiftung is organising the conference "The social impacts of economic policies in the Balkans." The conference will be held on Tuesday 28 October 2014 at the Hotel Metropol in Belgrade, 9:00 to 16:00 pm at the hall of the “Nikola Tesla”. The aim of the Conference is to review the economic policies in the Western Balkans and in Europe, and to support dialogue on appropriate policies for socio – economic development. The conference will be an excellent occasion to meet distinguished representatives from Ministries, social partners, experts and academia representatives from European Union and Western Balkan countries. The conference will be officially opened by His Excellency Mr. Krister Asp, Ambassador of Sweden in Serbia and Heinz Albert Huthmacher, Director, Friedrich Ebert Stiftung office in Belgrade. Important issues of harmonizing the ongoing reforms with the creation of conditions for employment and welfare of the marginalized will be in focus of many selected panelists including Mr. Olle Ludvigsson, a member of the European Parliament and member of the delegation to the Parliamentary Committee for Stabilisation and Association of Serbia to the EU, Croatian Deputy Prime Minister Mrs. Milanka Opacic , President of the Confederation of Autonomous Trade Unions of Serbia Mr. Ljubisav Orbovic, President of the Union of Employers Mr. Nebojsa Atanacković , and Mrs. Besima Boric, Member, House of Representatives of the FbiH Parliament. More details about the program and all the panelists can be found in the agenda. Video clip from the conference.